After eight days of adapting to living on a dry land, we decided to go back to sea and went sailing on Sunday. The weather was warm and wind mostly light so it was relaxed sailing to Bastholm, which is an island owned by the yachting club Stormy Fellows. We are not members of this sailing club, but were invited by Antti's friend to visit the island. We enjoyed seeing friends, having a sauna and swimming on a warm August day. On Monday it was time to take the boat up for inspection. As mentioned earlier, we hit an underwater rock in Norway at a speed of about three knots, so we did not expect to find anything too serious. However, our insurance company suggested to take the boat up for estimating the repair costs. 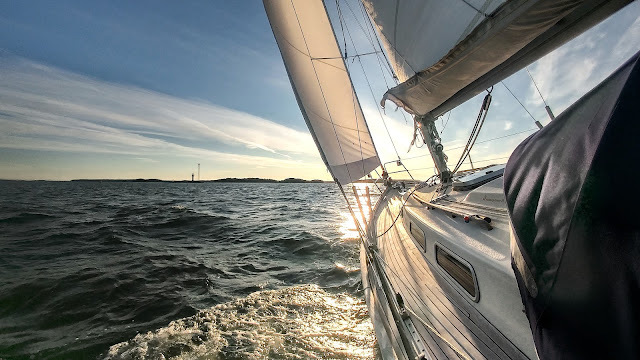 Thus, on way back to Turku, we sailed to nearby boatyard to take the boat up for inspecting the keel and taking some photographs for the insurance company. The operation did not go quite as planned since the small tractor had difficulties in pulling the Dolphin Dance, weighing about 5 tons, out of the water. Furthermore, the longish keel of HR29 makes it difficult to find good place for the lifting lines. 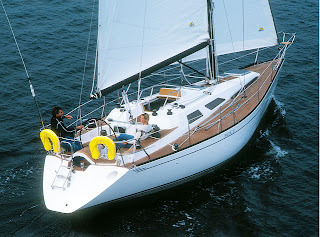 There is only a small space between the back of the keel and the S-drive and caution is required with the S-drive. After many attempts Dolphin Dance was successfully lifted and I was able to check the keel. There were no structural damages, but three scratches of about 5 to 10 cm diameter. The keel structure of HR29 is such, that the ballast keel is iron and moulded in GPR. The problem with this structure is that when the gelcoat gets deeper scratches, it absorbs water. Thus, when the boat is lifted out of the water later in the autumn, the scratches are opened and left to dry over the winter before applying new gelcoat surface on spring. After inspection, we continued back to our home port in Turku. This weekend there is a Culture Tall Ships Regatta coming to Turku so if weather permits, we are going to see the Parade of Sails at sea on Sunday. Thus, there are pictures of tall ships coming later.